With it looking like most of our veteran swift counters were more than willing to have another go at it, Vaux’s Happening considered expansion. Keeping an eye on the little swifts USA border-to-border is an ambitious effort, but why not follow them the total length of their journey? How many Mexican Audubon chapters are there? Just one exists in San Miguel de Allende, which is pretty much central Mexico. We sent out a Vaux's inquiry and got a reply saying there were only two records of the species there. So much for Mexico, at least for this migration. 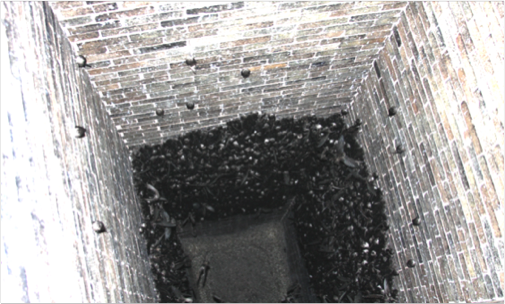 We tracked down a San Diego resident who in late April had witnessed swifts going to roost in a large chimney outside his window. That’s a good start. Madrone Audubon’s Veronica Bowers would cover the only well-known large site in the state again for us. That was huge, as she was top pencil with 20,000 on last year’s big day. Vaux’s Happening would also have a shot at discovering if these birds would also roost in rocks, when Steve Lombardi, who coordinates the Christmas Bird Count at Pinnacle National Monument, agreed to put together a team to check the Pinnacles each Saturday evening in May. Vaux's Happening sent out requests for roost site information to all of the California Audubon Christmas Bird Count Compliers Aug. 16, 09. While we had a 65% reply rate, we came up with no new sites. 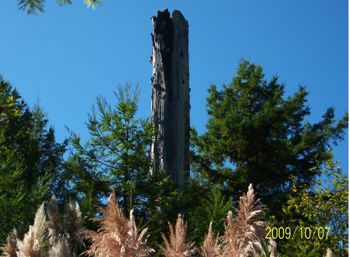 There were several that suggested the swifts were probably using some of the big old redwood snags that still exist in the northern California coastal range. Near the end of the southbound migration John Hunter with Fish and Wildlife got a report of just such a thing near Arcata that was hosting a thousand birds for several evenings. John is making plans for checking this tree out real good in the 2010 northbound. 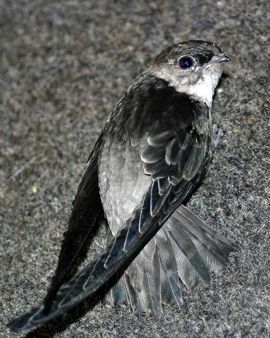 In the spring of 2008, the first research project focusing on the spring migration of the Vaux’s Swift in the Pacific Northwest was undertaken. This was an Audubon project, in cooperation with the Washington Department of Fish and Wildlife, Progressive Animal Welfare Society (PAWS), the Monroe School District, and the Washington state on-line birding list, “Tweeters." Most observers were Audubon members, PAWS volunteers, interested Monroe area citizens, and Fish and Wildlife employees on their own time. “Tweeters” was the main resource for roost site identification. Central CA birders under the direction of Steve Lombardi had eyes on the sky every week end in both migrations at Pinnacles National Monument. While there were some Vaux's Swifts seen, the idea that there is a major roost site somewhere in the rocks now seems unlikely. After a couple years absence the swifts are back in downtown Los Angeles. Thousands were observed feeding on insects over the LA River near the train station. Long Beach Auduboner Lindsay Fitch and friend made two trips into the downtown area to find the birds. The birds were located, but their roost site was not. One likely suspect is a big old brick chimney that has "The Brewery" painted on it. We hope to do some team work with the nearby Debs Audubon Center on this. It was a good year for Vaux's Happening in California. Nicole Nielsen-Pincus of Eugene took on the responsibility of coordinating an early May Saturday big day for her state; She would get a lot of people involved. We also got Portland Audubon interested in the northbound migration. They would come up with a totally new site in Oregon City. Bill Welch, who has a great back deck view of the Chapman chimney, would prove to be a reliable and enthusiastic counter for the project. Vaux’s Happening sent emails out to all 65 British Columbia Christmas Bird Count Compilers looking for help locating migratory roost sites. We got enough responses (48) to believe that there must be enough big roost trees left in the great white north that brick chimneys weren’t necessary. Vaux’s Happening came away with only two historic sites. One was in the very NW corner of the province and the other in the SE. Irene Manning had just started researching Vaux’s Swifts for the Fish and Wildlife Compensation Program in Nelson, BC. Vaux’s Happening’s good timing and Karma continues. Exciting news this summer out of Canada. Irene Manning had a successful nesting in one of her man made nest boxes. We believe this is a first for the species outside of Evelyn Bull's efforts in NE Oregon. The birds do get up there, but we couldn’t dig up a roost site. Vaux’s Happening set its goal as a global May 2, 2009 everybody counts big day. After that we would get as many May Saturday counts from as many different sites as we could. Our results are displayed here. Numbers were way down at several long time historic sites, but a great new one was discovered on Fort Lewis Military property. Nice shot of 900 swifts in action in this Greg Falxa photo. We're making plans to pay a lot of attention to this handsome old smoke stack come migration time. We also had a significant breakthrough at California's flagship roost site at Rio Lindo Academy, with the involvement of Brad Benson, who actually lives on campus. Brad has been involved with the swifts for several years on his own and provided us with a lot of data in 2009. 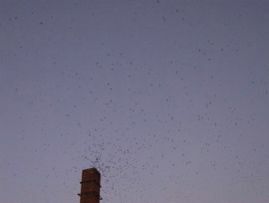 He also took this stunning photo of 6 to 7 thousand swifts inside the chimney at 11:30 PM. It's a stunner. 2009 Vaux’s Happening goes seriously international.